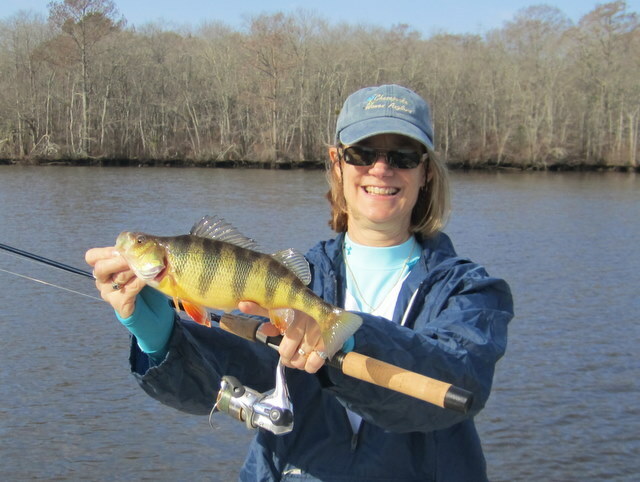 Josenhans FF ~ Pocomoke Bass Surprise! 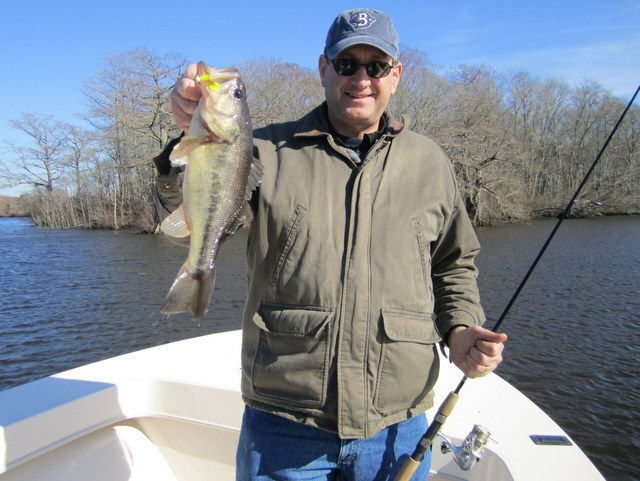 Having just completed four straight days of fishing the Pocomoke River we had another first for my Jones Brothers; the very first largemouth bass to come aboard my JB. I haven’t fished for bass in quite a few years, as the saltwater scene has kept me busy, and I have to tell you it was a pleasant surprise. While casting small jigs for perch, crappie and the occasional pickerel, we had five bass on Tuesday and three more on Wednesday. The largest was caught by Jack McHale on Wednesday morning and was probably pushing three pounds. The water was so cold (43 degrees) that, try as they might, the bass just couldn’t give us that classic, explosive head-shake. Fun never-the-less! 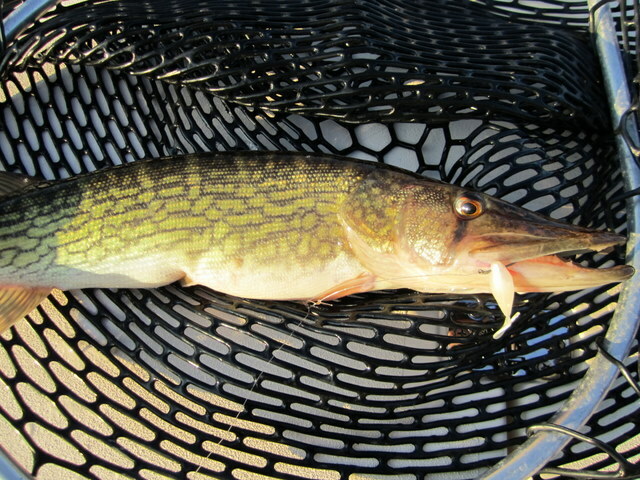 Pickerel were also present with fish to four pounds, though not in the numbers I had hoped for. I think we boated four on Wednesday and three more Thursday; the largest being a twenty-four inch brute. 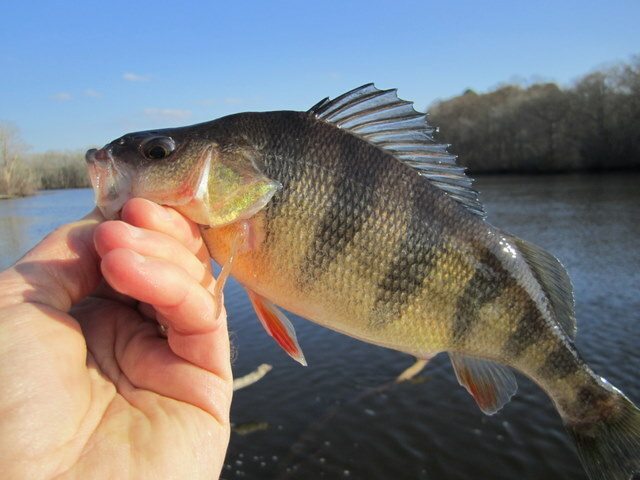 Yellow perch catches have declined of late. The fish we are catching are good-sized, and beautiful in coloration, but the larger schools of previous weeks have not materialized; at least not for me. I believe the perch to be fast making their way upstream for the spring spawn. 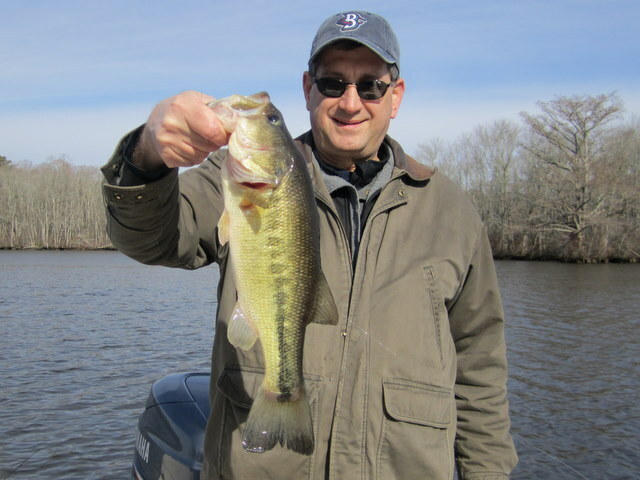 Thursday’s trip with Dave and Donna Corddry gave us beautiful late winter weather, but relatively slow fishing. 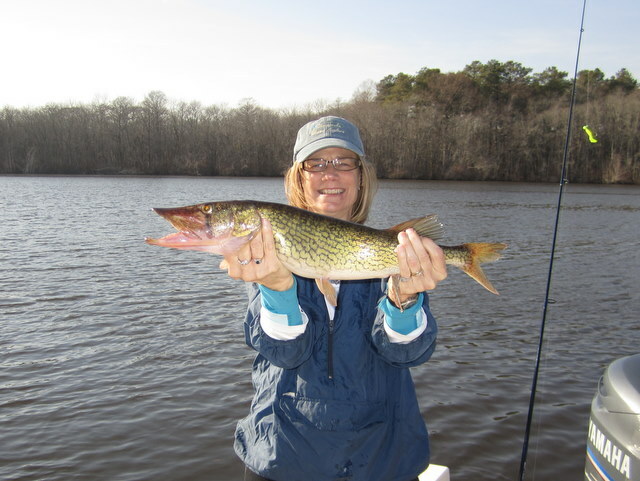 Donna did manage two bright spots on the day with a feisty twenty-three inch pickerel and a gorgeous twelve-inch yellow perch. While Dave and Donna prospected for fish, they were kept company by bald eagles, blue heron, various ducks and geese. On Friday I fished with George Lenard of Specialized Baits. We quickly discovered that pickerel and perch fishing had dropped off even more. On the bright side, we found a nice school of crappie that were eager to please. We had fairly steady action during the last hour of the ebb tide. Crappie are becoming more active as the water temperature climbs – it reached 50 in spots on Friday – and small 1/8 ounce crappie jigs rigged with a two-inch twister tail did the trick. When the bite is on, this is ultra-light fishing at it’s finest. 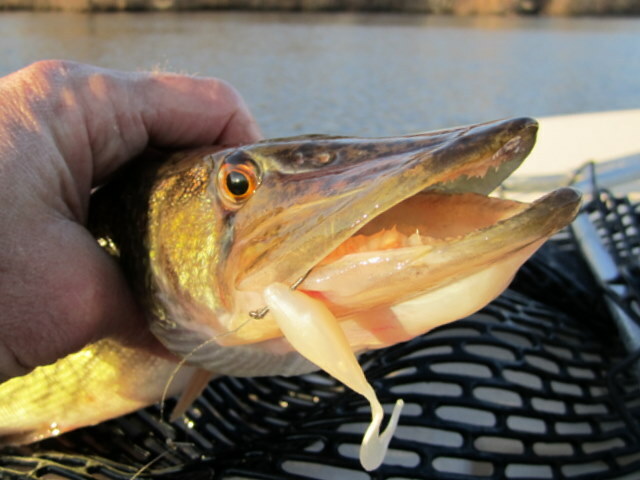 Catching a four-pound pickerel or three-pound bass on a five or six-foot light-action rod is just plain fun. My favorite outfit is a light spinning rod G. Loomis makes (SJR700) that measures 5’10” balanced with a Shimano Stradic 1000 reel. Loaded with four pound mono (sorry, I’m old school and don’t care for braid on my ultra-lights), this rod casts small crappie jigs like a dream. Another week or two on the Pocomoke then I’ll be switching gears and moving on to the Nanticoke River for the annual white perch run. I can taste the crispy fillets now! Until then, good fishing! Josenhans FF ~ TieFest and Lower Rates! I really enjoyed meeting and talking with everyone at TieFest today. What a great event! Thanks to Tony and all the volunteers who helped make it possible. Also, there will be an additional $25 deduction if fishing solo. Gas prices seem to have stabilized so I wanted to pass the savings on to you. I’m looking forward to sharing a great day of fishing with you all this season! I fished the Pocomoke River yesterday, this was my second trip this past week as I’ve been scouting for some upcoming trips. Launched at Byrd Park ramp in Snow Hill. This is a nice concrete ramp with ample parking. 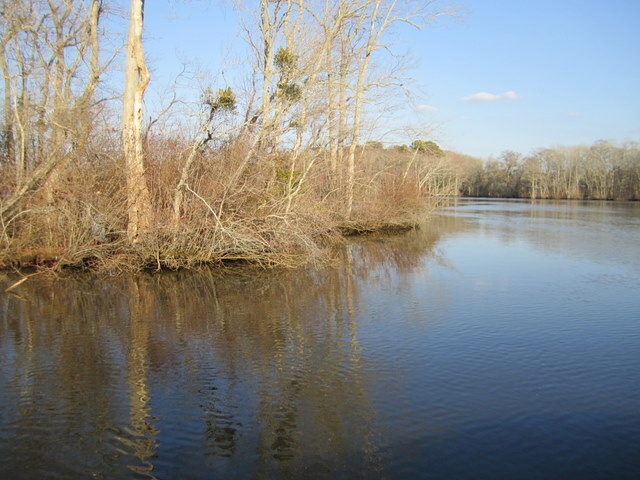 The water was clear, although the Pocomoke always has that tannin-stained appearance characteristic of cypress swamps. Sort of like weak, black coffee. The water temperature was 43 degrees, up from 41 of a few days ago, and I did find one spot on some flats that hit 46. The tide was just starting to flood, so I decided to cast to the channel edges where I had observed some fish marks in ten to fifteen foot depths. 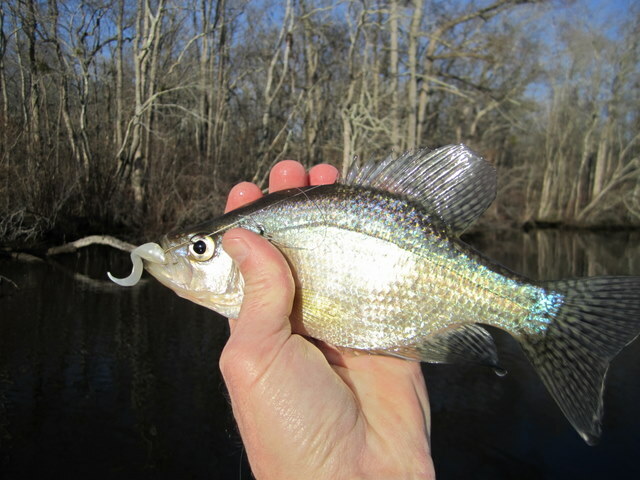 Using a drop-shot rig (basically a bottom-rig with soft plastic lures as bait) with two inch white Bass Assassin curly tails I drifted the edges, casting with a slow retrieve. I made certain to stay near the bottom where I saw the marks. The fish were slow to hit the artificial lure, but I did tease-up several plump yellow perch, crappie and even a nice 20 inch chain pickerel. Not bad for just two hours of fishing and looking, with the emphasis on looking. Matt Abell, a friend who owns Seahawk Sports Center in Pocomoke City, told me last week that while the water is this cold minnows seem to really increase your catch. That said, I was happy with the action and I didn’t have to mess with bait. Weather permitting, I’ll be spending a good bit of time on the Pocomoke during the next few weeks. The fishing will only get better as the water warms and the fish become more active. As you can see from the photos, there is a nice variety to be had here on the Pocomoke and the scenery can only be described as peaceful. Bald eagles, ducks and geese keep your attention while waiting for a bite.